Did you know that gum disease is the leading reason for tooth loss in Americans? Many people believe that gum health is secondary to dental health, but the two are so closely related that they are both a top priority. Maintaining healthy gums is important for the long-term health of your smile. If you notice any signs of gingivitis (the earliest form of periodontal disease), there may be time to reverse the disease by improving your gum health. Some signs of gingivitis include red puffy gums or bleeding from the gums when you floss or brush. However, once periodontal disease reaches the more advanced stages, it cannot be reversed. Dr. Young in Lafayette, LA wants to help you improve your gum health and your overall oral health. Every single day, you should be brushing your teeth for at least two minutes twice a day. If you are skimping on the time of the session or not doing it that frequently, it is time to step up your routine. When brushing your teeth, it is important not to brush too hard. Doing so can irritate your gum tissue and erode your dental enamel. Use a soft toothbrush with gentle but firm circular motions to brush every surface of every tooth. It is also recommended that you floss at least once daily. An electronic water flosser can be a great alternative. 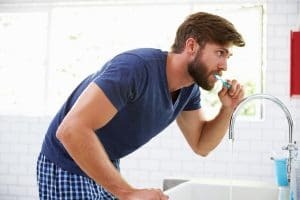 Using a non-alcoholic mouthwash after you are done brushing and flossing can be another step to remove gum-disease-causing bacteria from your smile. A balanced nutritious diet is often enough to supply you with the vitamins you need. Eating enough Vitamin C and Vitamin A can help keep your gum tissues strong and healthy. People with Vitamin C deficiencies can often experience issues with their gums. Before taking supplements or doing a complete overhaul of your diet, it is important to discuss with your dentist and other healthcare professionals.